Every week Wired Science (on Hulu) covers a wide variety of scientific and technologic topics. The episodes I watched so far are pretty impressive and educative, especially when it comes to recent advances in medicine. Based on the work of Dr Paul Bach-y-Rita on brain plasticity (the ability to adapt and re-configure itself), researchers are now able to give blind patients some limited ability to "see". Although the signal is input through a device on their tongue (like a matrix of pixel) it actually goes across senses and triggers the visual cortex. As he observed, "You don't see with the eyes. You see with the brain." Similarly, for a patient that lost her sense of balance (after the little hair cells in her ear were damaged) a similar device allows to substitute a natural sense with an artificial one. The surprising part is the residual effect: the patient keeps a feeling of stability when not using the device. One of the segments reveals how some Parkinson's disease symptoms can be improved. A former patient and one about to undergo the surgery show how their hands were shaking uncontrollably, due to an area of the brain firing random signals. Although doctors don't exactly know why, they found that implanting pulsating electrodes (like a pacemaker) in that area of the brain limits the symptoms and improves motor control. Aside from the before-after results, the awake surgery is fascinating: to find the right area of the brain, a probe is used, which listens to neurons and you can literally hear the area of the brain corresponding to the patients hand. This episode demonstrates a robot-assisted heart surgery. The surgery is much less intrusive and yet gives the surgeon rich manipulation capabilities, as the robot tools have similar mobility and dexterity to human wrists. This allows for fine suturing in enclosed spaces. But the robot itself, aside from costing a fortune, is also still quite bulky. An interview with Cameron Sinclair about architecture for humanity (network for designers to share ideas and solutions) and the Design like you give a damn book, with many innovations for the poor. He gives a few examples, such as houses made from long sandbags coiled into a dome shape. These shelters are very cheap (cheaper than a refugee tent), more durable and require very little goods to be transported. New UN tent, which is light, uses a smaller surface areas, pops out and has a divider for privacy. The Grip Clip, a clever piece of plastic which is very versatile for assembling tents from local materials. It fastens the membrane to the support structure. That said, in an episode of Man vs. Wild, Bear Grills was showing an equivalent solution using a round stone and a string. 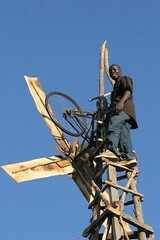 Along the same lines, there are great examples of entrepreneurship which can improve the conditions of life for poor farmers over the world: windmill electricity and water pump (amazing story of a 14 year old kid, pictured here), affordable drip irrigation systems in India (targeted for a 1$/day families with small fields, yielding 2x or 3x income increase to 300.000 farmers and resilience to dry seasons), cheap and local bed nets factories, cheap private healthcare (maternal hospitals, ambulances). Those last projects are done as a mix of charity and market solutions (philanthrocapitalism) to lift people out of poverty.